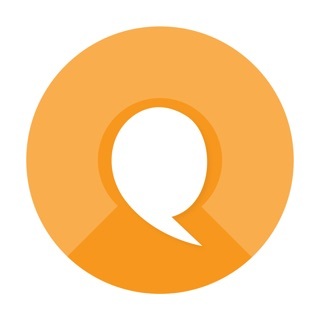 Mirakee is the most addictive writing and blogging platform connecting a global community through the power of words. Showcase your quotes , poems , stories , micro-tales , terribly tiny tales , emotions , blogs , thoughts , haikus , haiku jam or any kind of writings and design them into visually stunning posts using creative designing tools. Launched in July 2016, Mirakee is a completely new experience of writing. It is a paradise for writers, poets and readers. Write and edit your quote or poem or story and copyright your original words. 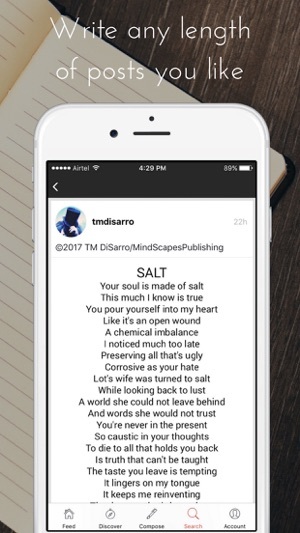 Share your writings across various platforms. 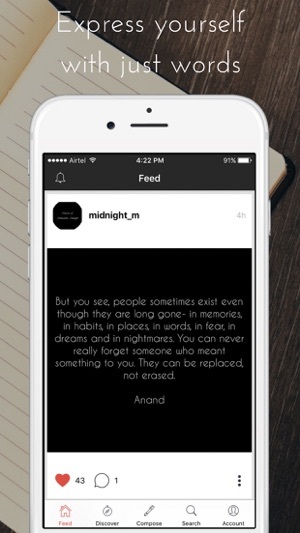 Mirakee is famously known as Instagram for writers and poets. Get creative with daily writing challenges hosted on Mirakee. Participate in exciting writing challenges and write quotes, poems and stories using word prompts. Grow and learn together with this vast community of writers, poets and readers. Use designing tools for greater visual impact. Build meaningful color relationships to create visually stunning posts, use eye-catching images and beautiful fonts to bring your words to life. We bring art and writing together. Discover content created by writers around the world. Whatever you like to read —whether it’s poems , quotes , micro tales , terribly tiny tales , tweets , short stories , thoughts , ideas , emotions , haikus , haiku jam —you’ll find it on Mirakee. Connect with passionate writers by following and commenting on their write-ups. Use drafts to capture what’s on your mind and organize your thoughts. Your drafts are private to you and are not visible to anyone else. Turn all your writings Google searchable under your pen name by sharing at least 20 posts on Mirakee. Your write-ups are then found as a result for the search query - “Your username Mirakee write-ups”. Write and read in any language - All languages are supported by Mirakee. Writers on Mirakee are writing poetry and quotes together in many languages including English, Hindi, Urdu, French, German, Spanish and many more. Inspire the world with your words. I do love the app, despite the three stars. It makes it easy to concentrate on composing words and then format them for sharing. It’s the technical aspects. I’ve been waiting for the ability to save a draft for a while in the iOS version. This is because sometimes I don’t finish what I’m writing and closing the app loses what I just wrote. Second, the formatting seems a little unintuitive. 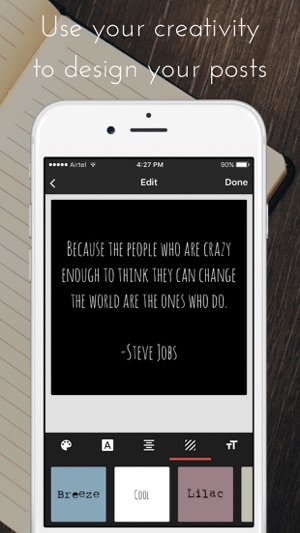 It isn’t as streamlined as other text formatting apps like Typorama. I didn’t want to delete this app, but these issues were taking away from what is supposed to be an easy way to write and share. Enjoying this platform very much! I love the versatility for the posts, and I’ve found it to be a great place to share and find writings. Mostly poetry. 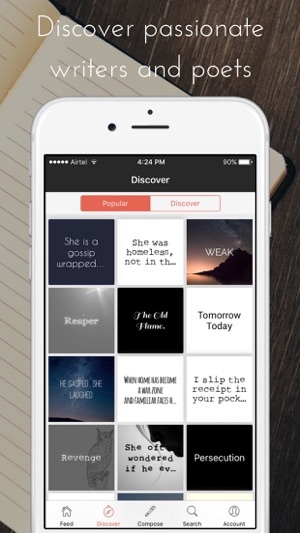 This app has allowed me to find inspiration to begin writing consistently again. I have one suggestion for the text formatting: along with the left, center, and right (horizontal) alignment options, please include top, middle, and bottom (vertical) alignment options as well. 1. Reply to comments in the comment section. 2. Direct message to a profile. I love the idea of the app. Kudos to developers! Its just a basic app so upgrading these few point can surely make a user feel more appreciated.